A Quiet Corner: Another Light? Good gravy, it seems all we've been doing is...is shopping for lights. Of course, the upside to that is that I get to enjoy all the "hot dates" that seem to go along with the shopping. You see, I need energy to shop...energy that will sustain all the brain power, the walking up and down the isles, the recall of the room sizes, wall sizes, window locations, etc. Hence, "the works." This date was at Second Helpings in Roanoke. I ordered a hot dog with "The Works". On the menu it said, "eat it with a fork"...and so I did. 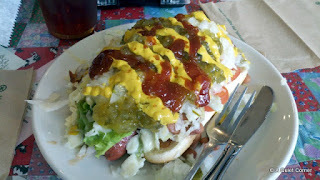 It was really quite tasty as it had a hot dog and bun along with onions, cheese slaw, tomato, lettuce, cabbage, pinto beans, mustard, relish, ketchup and sauerkraut. 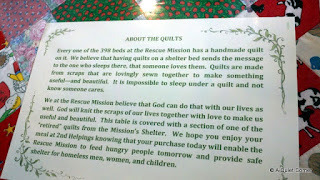 A portion of the cost and all tips go to benefit The Rescue Mission, a much more important cause than my meager appetite! P.S. Talked to our builder last night. The hardwood floors are done on the main level!! The house is a ranch. However, the basement has two rooms, a full bath with a huge walk in shower, hallway and laundry room. Ceramic tile will be in the laundry and bath. The stairs, landing, hall, bedroom and office will all have something called "engineered hardwood" which is wood with a type of backing since it is being installed on concrete. This will be easy maintenance in letting the dogs in and out let alone access to the stone patio. Even at 6:15 AM, that hot dog looks Gooooooood! Maybe I should eat some breakfast, eh? I bet you'll like your hardwood floors. So easy to just swipe a dust mop over. That looks great! The Multiples Club board meeting met there once and had breakfast, but I missed that meeting so I didn't get to try it. I'm with Louise. It may be breakfast time but that hot dog looks good. Solid surface flooring. I can only dream. That dog looks downright delicious! now that's a dog i could sink my teeth into!!! Now, that's a loaded dog! That dog looks all dressed up~! Eat with a fork and a spoon to gather all the goodies that fall on the plate..
Glad to hear your hardwood floors are installed on the main floor. I just love hard wood floors and would give away this wretched carpet anyday..There is wooden planks under the carpet ~ would love to take out carpet and redo those boards..My Mr. Pres. would never go with that. Pass the Tums..that dog looks awesome! I dream of hardwood floors! Oh my JP! I thought it was some kind of a salad with all the works! lol I never imagined it to be a hot dog! A fork is needed indeed! That looks like two meals! Sounds like the house is moving right along. Ok that dog looks so good. I will have one to go without the doggy in it! Yummy! Your home is going to be great when its done!